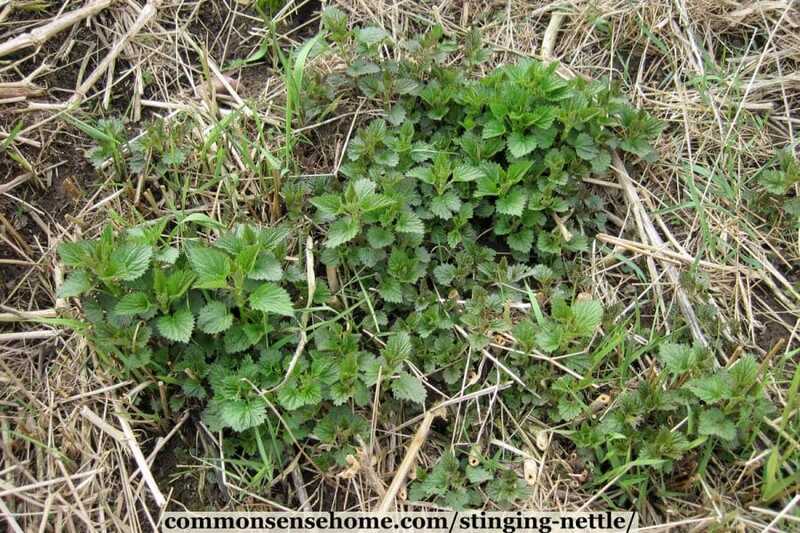 Stinging nettle is also known as common, slender or tall nettle; stingers, wild spinach, and devil leaf. Nettles are a perennial plant found in the United States, Canada, Europe, Asia, Africa and South America. They prefer high nitrogen soil with plenty of moisture, like the edges of farm fields and along rivers. If they show up in your garden, you might want to relocate them before the plants get too big. They spread via rhizomes, and can take over a garden bed completely. Planted along an edge they can protect your garden, but be wary of spreading. If you don’t have your own stinging nettles to gather, there are a wide variety of nettle products on the market. Health food stores, online merchants and enterprising herbalists sell everything from herbal tea, to salves to freeze dried nettles. The mature leaves are oblong and deeply toothed. They are 2-5 inches long and found in opposite pairs every few inches along the upper half of the stalk. Young plants will often have a purplish tinge as they emerge from the ground. The entire plant is covered with fine stinging hairs and grows from 3-7 feet tall in temperate climates. (Warm climate Urtica dioica can grow up to 20 feet tall.) Stalks are hollow and squarish, with four deep grooves running along their length. The stem contains strong fibers, historically used for rope, fabric and paper. Nettle roots form rhizome networks, similar to quackgrass. A healthy colony can spread five feet or more in a season. Touching a nettle plant with bare skin will produce a stinging or burning sensation. Each stinging hair contains toxin at the base. When you brush against the plant, the tip of the hair breaks off. This broken hair acts like a hypodermic needle to inject formic acid (also found in ant bites), histamine, acetylcholine and other irritants. The rash will subside on its own over time. To speed up the process, try applying crushed plantain, jewelweed, dock, rosemary, mint or sage. If you don’t have herbs available, boil and cool a cabbage leaf for a poultice. Antihistamines may also help. Some people use toothpaste as a home remedy for nettle sting, but there’s not much evidence to back that option up. Can you die from nettle stings? Not likely, unless you have a severe allergic reaction, but it’s best to limit exposure until you see how your body reacts. Some people are more sensitive than others. Don’t confuse the sting from nettles with phytophotodermatitis. 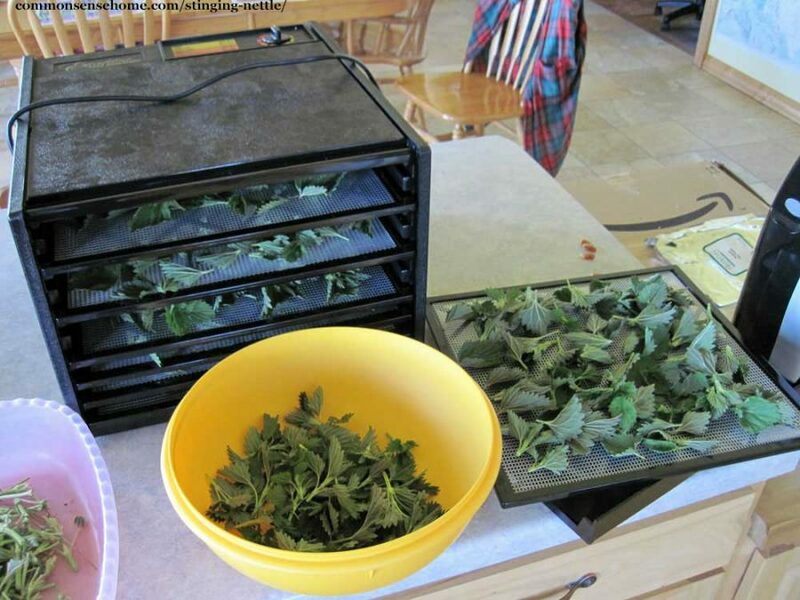 Harvest fresh nettle tops in spring to use in cooking, or keep the plants cut back and harvest fresh growth throughout the season. Use gloves, or handle with care. Use nettle as you would any cooked green. They are rich in vitamins and minerals, including vitamins C and A; calcium, potassium, magnesium and iron. Nettles are also very high in protein. Do not eat the leaves raw or undercooked. Heat neutralizes the sting, but sensitive individuals may still not tolerate them well. Blanch for two minutes, sauté or steam. I did not react to a dried leaf infusion. I did react to fresh leaf infusion. Nothing serious, but I'll make sure to thoroughly cook or dry my nettles before consuming them in the future. Note: Healing Wise has a very nice assortment of nettle recipes for food and for hair and skin tonics.The Forager's Harvest is another good resource for harvesting and cooking tips. 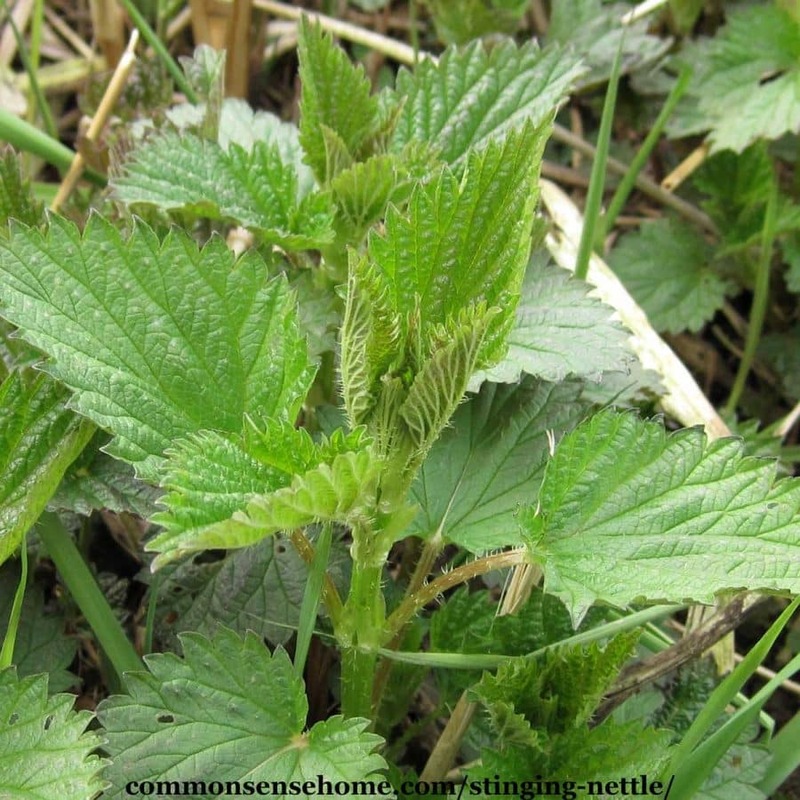 Stinging nettles play host to a wide variety of insects and provide food for many other critters. They are the only food source for the larval form of the red admiral butterfly. When I was a little girl, my mom would always add some chopped leaves and sour milk to cow feed to feed to the baby ducks and geese. 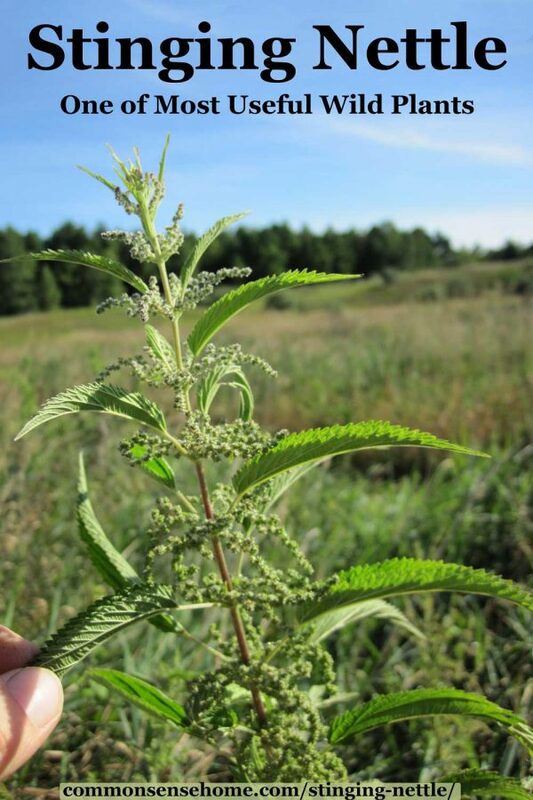 In Healing Wise, Susun Weed sings the praises of nettle for just about everything, lauding it as a hair and skin tonic, adrenal booster, bone builder, gout healer and more. It acts as an anti inflammatory, and is loaded with nutrients. Using capsules or tea leading up to and through allergy season may help to reduce seasonal allergy symptoms, including allergic rhinitis. Historically, nettle arthritis treatment includes oral use and urtication. Urtication means flailing the affected joints with the plant. Read more in the post, “Home Remedies for Arthritis“. Nettle leaves were used traditionally to help treat diabetes mellitus, and modern studies indicate that they may help type 2 diabetic patients improve glycemic control. 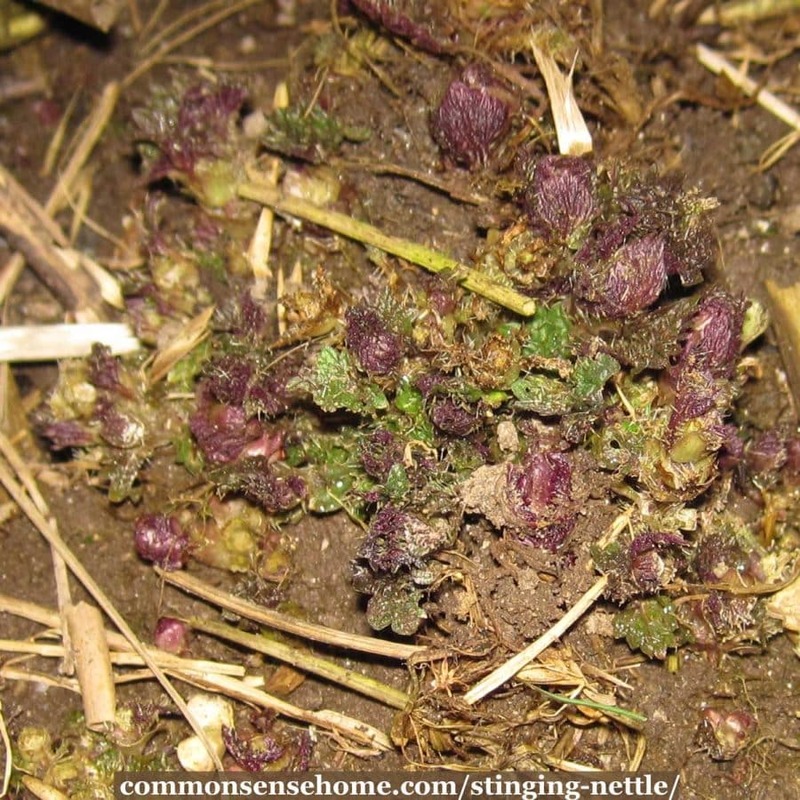 Nettle has a long history of use for urinary tract health. Initial studies indicate that the bioactive phytochemicals in the plant may inhibit calcium and oxalate deposition and crystal growth. 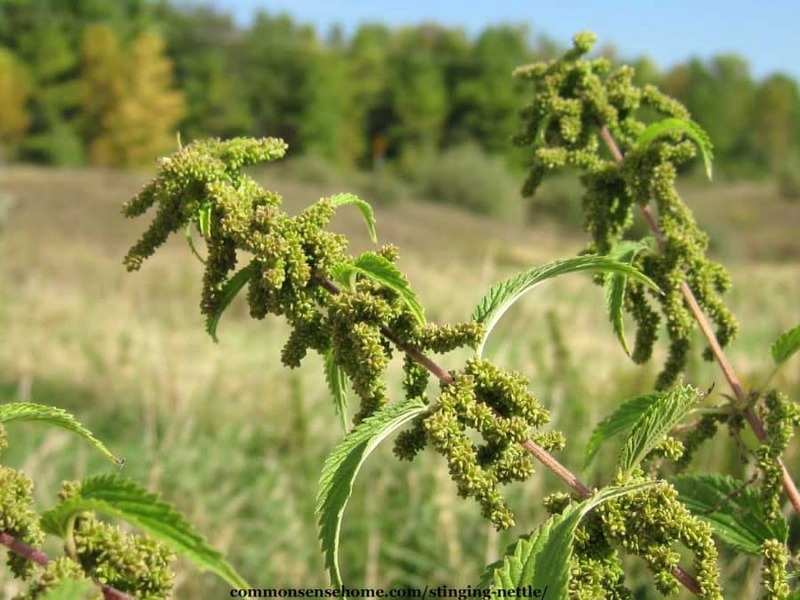 Studies have shown that stinging nettle extract may help relieve symptoms of Benign Prostatic Hyperplasia (BPH), a common health problem for men over 60. It may be used alone or in combination with saw palmetto. Rat studies have also shown an increase in testosterone with the use of Urtica dioica, but this has not been replicated in human trials. Cover a tablespoon of dried leaf or crushed fresh leaves with a cup of boiling water. Let steep for 15 to 20 minutes, strain and drink. Sweeten with a bit of honey or maple syrup, if desired. The tea can also be used as a hair rinse or massaged into the scalp to promote hair growth. For acne or other skin conditions, dab cooled tea onto the affected area. To make an infusion, simply pour one cup boiling water over one ounce dried chopped leaves (by weight), cover and steep 4 hours or overnight. Strain out plant material and drink. Refrigerate any leftovers and consume within 48 hours. The books Backyard Medicine and Healing Wise have a wonderfully detailed information on making and using nettle remedies. Always consult your health care provider if you are on any medications, nursing or pregnant. Nettle may enhance the effect diuretic medications, and also increase excretion of lithium and other anti-depressant medications. In the video below I show off our patch in spring. Loaded with nutrients, nettle tea makes a great plant food. You can also add the leaves to your compost pile for some extra “oomph”. This post is part of the Weekly Weeder series, which is devoted to helping you use and manage wild plants. Improved glycemic control in patients with advanced type 2 diabetes mellitus taking Urtica dioica leaf extract: a randomized double-blind placebo-controlled clinical trial. Originally posted in 2012, updated in 2019. 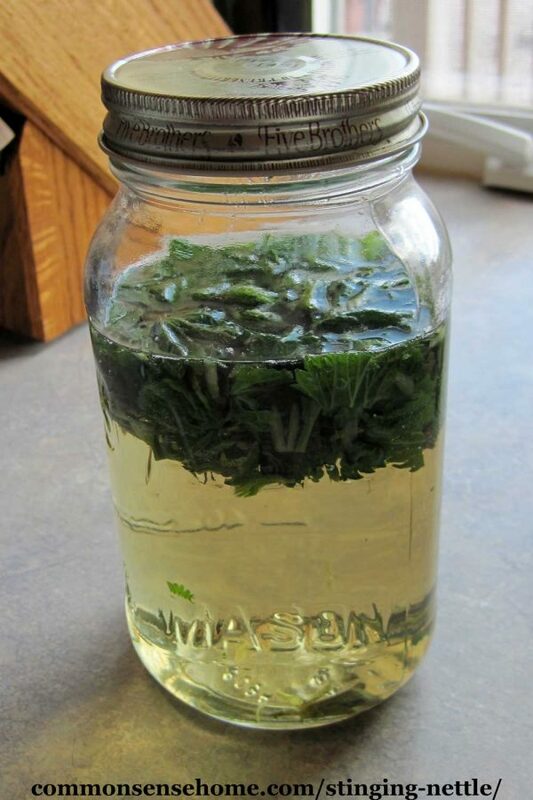 I tend to saute my nettle in just a tiny bit of oil – I’ve wondered, though, if steaming would get rid of the itch, as it would certainly retain more nutrients. What do you think? Phil – only one way to find out for sure. Each person reacts to things a little differently. All Susun’s recipes call for greens to be well cooked, and after my experience yesterday, I think I’ll stick with well cooked. My mouth still feels a little funny. I have been eying up the nettle beer recipe…. If you simmer the fresh leaves for a minimum of 10 minutes you will eliminate the stinging properties. Then you can eat the leaves and resulting broth/tea. Nettles do produce a stinging sensation when you touch them. I would not walk bare legged through a field of nettles, unless perhaps I was trying to treat joint pain in my legs. Some people flagellate joints afflicted with gout type symptoms with nettle, as the stinging is supposed to refocus the pain away from the gout pain somehow. I have not tried this. If you do try the nettles, make sure to cook thoroughly, and try only a small amount. It says “To make a nettle infusion, simply pour boiling water over one ounce fresh or dried chopped leaves (by weight)” … is this correct? As we all know, an ounce of fresh is a lot less than an ounce of dried, wouldn’t the dried be super strong, or the fresh be super weak? Isn’t it like herbs, where you divide by about 4 fresh to 1 dry? Lora – yes, you are right. It really doesn’t matter too much if an infusion is much stronger, but in this case the dried herb is much less likely to provoke a reaction. With other herbs, I generally just chop and go, so I gave the measurement as a rough guideline. Hi, Laurie. You’ve inspired me to gather nettles! I have lots. I was wondering how long you dried yours and at what temperature. (I also have an Excalibur.) Thank you! Hi Sarah! I dry them at low temp (herb setting) until crisp, around a day or so. My name is Clayton Wangbichler. I work for Mountain Bike Action Magazine. I’ve written a story, regarding pretty plants on the trail that leave a bit of a bite. Living in the desert of Southern California, I don’t have the ability to photograph these plants. Would you be willing to grant me permission to use the top stinging nettle photo above? The photo may be used with credit and a link back to the site. Nettle is so neat. I’ve been meaning to try tea and various soup recipes… It makes real neat twine too. I know that it’s tough. The canes are always standing come springtime. Around here nettles are most often encountered along streams and other damp places. Fortunately it is also the home of Jewelweed. In fact they are frequently growing side-by-side! This is very convenient as the sap from the crushed stems of jewelweed IMMEDIATELY soothes the sting of stinging nettles. It’s also good for other skin irritations, including poison ivy and bee stings. Jewelweed, learn to identify it. It truly is a jewel! What a great article and video! Thanks so much–I love your explanations and how you kept the camera on the plant for so long. It really helped me in terms of what nettles look like. I’m currently reading Susan Weed’s Healing Wise and nettle is my first herbal ally! Thanks again! You’re welcome. I hope you enjoy other posts in the series as well. I’m slowly working through them, adding more information and larger photos. Blogging has changed quite a bit over the years. I was harvesting wild greens for my rabbits when I felt a prick and some burning. I didn’t know what had stung me, but closer inspection revealed young nettle plants at the edge of my garden. I was pretty excited to find it, but boy that sting was something else! I went to bed with it still throbbing, but woke up to see it had worn off. I had it in my head that a poultice of nettle leaves soothes arthritis. Have you heard of this? I haven’t personally tried it, but nettles are commonly used for arthritis treatment externally and internally. The poultice option may work well for those who are not up to beating themselves with the plant. We find that nettle tea works very well for seasonal allergies. We use it as a tea. I don’t mind the flavor plain. Thanks for this well-researched post. I enjoy learning about weeds and wild edibles. Great article, Laurie! I use the seeds to restore kidney function. The fibers in the plant are used to make cloth. I love this plant! I grow it on the perimeter of our yard to help ward off unwelcomed guests…lol. Thanks for sharing your experience, BJ. There are so many historical uses of this plant that it was hard to pick just a handful to keep the article from getting crazy long, so I hope more people chime in with their experience. Do Not eat old leaves! Not good for you! Old leaves are not good for eating, but can still be used for tea.